1) Soler Dominican, who in 2008 became the first Red Hook Vendor to become a Vendy’s finalist, will join several other Brooklyn Flea vendors in taking over the concessions at Central Park’s Summer Stage. 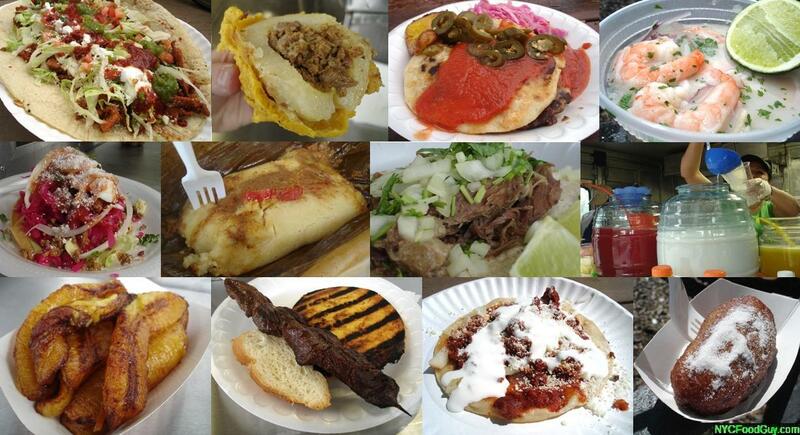 This means you’ll be able to eat delicious El Salvadoran pupusas (top row, below, 2nd from right) and Dominican carne asada – complements of husband and wife team Rafael & Reina Soler – during the outdoor arena’s 36 performances and films this year. 2) The Red Hook Food Vendors will return to their respective spots around the ball fields on Saturday, May 1st. Only thirty three more days to Martinez’s Spicy Enchilada Pork Huaraches, quite possibly the most delicious thing on masa. Weather permitting, the vendors return every Saturday and Sunday through Halloween. If you haven’t visited the vendors, you’re missing the single greatest gathering of Central American food in New York City. You will feast for fewer than $20. Questions? In need of recommendations? E-mail [email protected]. i want to go this year!!! Man! It was so awesome to be a part of the action!